Arroz chaufa is similar to fried rice. Arroz chaufa is a common rice-based dish, similar to fried rice, in Peruvian cuisine. "Chaufa" comes from the Chinese word for fried rice, “chaofan.” There are several variations of arroz chaufa. The dish typically consists of one or two types of meat, rice, eggs, green onions and simple seasonings. Modify this recipe with your favorite meats, vegetables and sauces to make it your own. Approximately 10 minutes is required to cook arroz chaufa. This recipe serves six to eight. Heat the vegetable oil in the deep skillet for three minutes over medium. Add the pork, chicken and ginger to the skillet and cook them for four minutes. Stir the contents of the skillet frequently to prevent the meats from burning. Add the chopped green onion and scrambled eggs to the skillet and stir for 30 seconds. Stir the rice and soy sauce into the contents of the skillet. Remove the skillet from the heat and serve the arroz chaufa while it is hot. 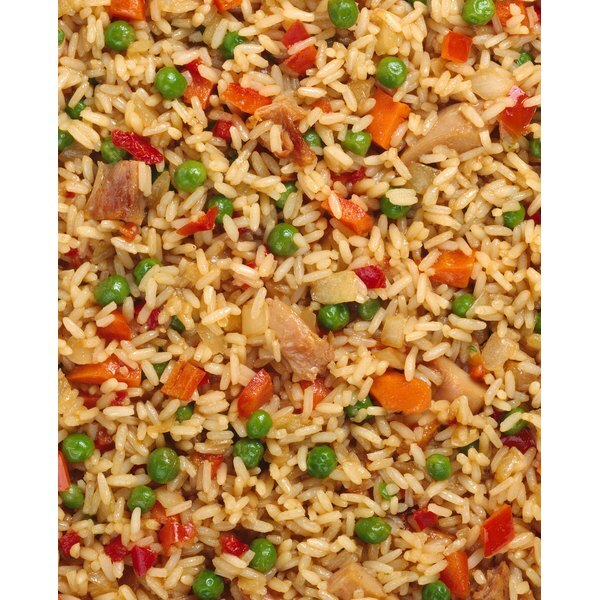 If you would like to add other meats or vegetables to the arroz chaufa, do so while you add the pork, chicken and ginger. Refrigerate leftover arroz chaufa immediately and consume it within 48 hours. Reheat the arroz chaufa in a skillet over medium for best results.